Height: 14.2 Hands Weight: 1,000 Lbs. Maximum Poco Bueno crossed to Old Sorrel, King and Poco Bueno. 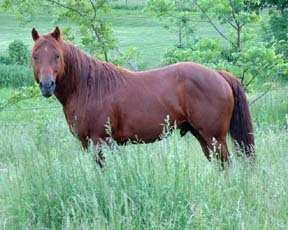 His colts were born with good looks and a great disposition. Maxium had an excellent disposition, loads of personality, and a very natural, low, and pretty headset. His colts are a pleasure to be around and break out nicely. We kept Maxium back for several years just so we could cross his bloodlines back into the program later. The Poco Bueno bloodlines keep the good feet and legs in our herd.